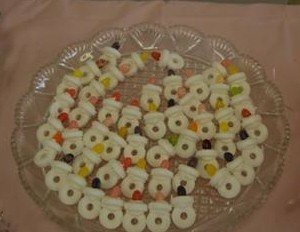 To make these candy necklaces, you will need approximately 30 white lifesavers and 15 colored jelly beans. 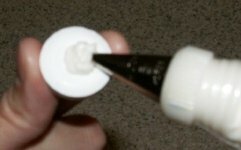 Place one lifesaver on top of another lifesaver like a "t" and glue together , then place a jelly bean on top of the lifesaver (on top of the "t") and glue. 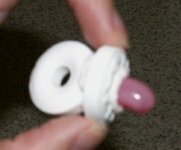 Place a ribbon through the loop of the other lifesaver and you have a great party favor for the baby game. Thanks for the great idea Amanda! We've added some step by step pictures to help you make this baby shower craft. Using a small frosting tip, fill one side of a lifesaver with royal icing. Add the other lifesaver by placing it in the icing to create a "T" shape. Let dry. 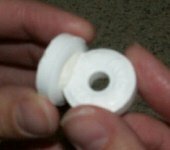 Fill the other side of original lifesaver with icing. Stick a jellybean in the center of the icing and let dry overnight. Cut ribbon to a necklace length and attach through the remaining lifesaver hole. The royal icing is great to use because it is both edible and very strong. 1 1/2 cups of powdered sugar. Blend egg white with 2/3 cup of powdered sugar. Then place bowl in microwave and heat for 30-60 seconds (to kill bacteria and make safe for eating). Check temp - it must be at least 160 degrees and not more than 175 degrees. If you would like to give you candy necklace a different look, here are some additional ideas to use. Instead of using a jelly bean, you can try using a gumdrop, lemon drop, or Mike and Ike candy. In place of the top lifesaver, you can use a colored candy melt wafer. 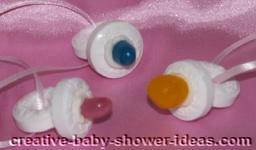 I made these pacifiers out of life savers and jelly beans for my granddaughter's baby shower. Everyone loved it. I also made a cake out of diapers.